The Tough 1 600D Waterproof Turnout Blanket stands as our top pick on the list. Why? It works better for protecting your horse against all natural elements including rain, dust, and strong winds. It ranks the best for its waterproof features to keep your equine dry and warm for longer. It is made of 600 denier poly with a medium fabric strength. Also, the heavy-duty binding of the fabric, especially the nylon, makes everything so much simpler. The Tough 1 1200D Snuggit Turnout Blanket is our upgraded buy. What this means is that you are compelled to pay a higher price than our top pick, but the features are well worth the investment. If you tend to look for high priced products for better quality and performance reliability, go for this one. It features a 1200 denier build with high fabric strength. The best solution for horses that are often fidgety. So if your horse chews and bites on stuff, this one has a durable resistance to prevent any unwanted tears. For simpler and less costly purchases, go for the Derby Original Classic Blanket Sheet. It is one of the best horse blankets for fleece protection. It features surcingles, sturdy front buckles, and an adjustable tail tie for a good and accurate fit. What’s more? It has proper insulating properties making it a good buy for anyone willing to buy within a budget. You can now keep your horse clean and tidy without worrying too much about the blanket’s upkeep. The main goal of a horse blanket is to protect an equine from elements such as water, dust, rain, or even cold winds. The emergence of blankets for horses can be traced back to the years when the use of them became an absolute law. In fact, back in 1917 many activists believed that every equine deserved to wear a blanket, especially those who stood out on the streets and were subjected to harsh environmental conditions. At the time of their invention, they featured surcingles, blanket pins, small straps, and heavy to lightweight materials. Based on the weight of your equine can you buy the right material, build, and shape of a blanket. It is similar to that of a human jacket, since the best horse blankets are tailored to fit a young or adult-sized equine. According to the Native American culture, horse blankets were woven in bright and earthy colored tones with a fringed design. They were traded among equine owners and were quite a popular commodity used by most riders. It is established by the Western culture that you need both a saddle and blanket for your equine for riding comfortably. A blanket not only protects the equine from the environment, but it also prevents the saddle from rubbing against the skin while riding. So when choosing the best horse blankets, look for features like the thickness of material, color, texture, and fit. You will find varied cooling, foal, anti-sweat, and turnout blankets based on your ideal preferences. Once you decide to choose a comforter, you will be presented with tons of options. This is because some horse blankets are good for cooling while some for warming your equine. Some blankets come with therapeutic properties while some keep the dust away. Before you decided on a comforter’s specific features, look at the different types to clearly understand what you need. Turn-out rugs come with incredibly durable properties including waterproof, breathable, and warm fabric lining. These features make a turn-out rug one of the best horse blankets for flexibility and movement. That said, other important features of a turn-out rug include rugged straps around the belly, leg, and chest region. It even features high gussets and pleats around the neck to take the pressure off of your equine’s shoulders. This latter feature is vital because it allows better movement, even if your equine has a preexisting sweating condition. The bottom line is that a turn-out rug or blanket is the most breathable comforter, in addition to its waterproof and vapor-proof qualities. A stable comforter is also commonly referred to as a night blanket. They are generally used to keep horses warm and clean when they’re resting inside a stall. Stable blankets can have both a cooling or a warming effect. This factor depends on a comforter’s fabric insulation and fabric weight. That said, you should also know that the most common stable blankets are often lightweight, designed to keep your equine away from dust. An exclusive feature for a stable blanket would be adjustable leg straps to avoid shifting or lack of movement. Coolers come with anti-sweating properties in versatile colors, sizes, and shapes. Think of a cooling blanket as your regular go-to comforter to prevent your equine from feeling extremely cold. So it does the job of absorbing sweat and wicking away moisture and chilled air. A cooling comforter looks like a giant square of a fabric with sturdy ties on both sides. You can drape it over your equine. However, if your mare moves around a lot with this on, it might slide off quickly. A fitted cooling blanket comes with a standard buckle system with straps and fastenings. You can put this on your horse once she’s in a stall. The fabric is durable, easy to clean, and breathable. Common cooler materials include mesh or a thin fabric. You can pick is much thicker fabric if you need it for the winter months. A therapeutic comforter is good for providing warmth and soothing muscles. But it isn’t as inexpensive as turn-out rugs or a stable blanket. This means you can use it to help relax your equine after a long, tiring day. It contains exclusive non-fabrics that allow better ventilation to heal and sooth muscles. This kind of technology is extremely popular among hardworking equines in the industry. A rain sheet is such that is designed of only waterproof materials. High-quality sheets are feature a cotton lining to keep water away from your equine during the monsoon months. Even if you’re not taking your equine out in the wet weather, a rain sheet can be of great help. The waterproof fabric keeps your mare dry and warm. Meanwhile, the breathable fabric reduces heat and sweat build-up inside the sheet. Rain blankets have seen plenty of transformations based on their design and fabric. Traditionally, rain blankets were responsible for skin irritations due to humidity buildup inside the blanket. This is because former equine blanket brands used non-breathable, but waterproof fabrics that were suitable for only short periods of time. But not anymore. It’s important to know that a rain sheet is only useful during the wet weather. Avoid using on during the winter months as it doesn’t have insulating properties. A rain sheet worn in cold weather might cause hair loss and bald spots as it mats down the hair. These are traditional mesh-made sheets that feature gussets, pleats, legs, and belly coverings. They look a lot like a cooling blanket, but are more form-fitting and contouring than our previous choices. A fly sheet is good for UV protection and insect protection. It prevents insects from biting your horse’s belly, shoulders, neck, and belly. UV rays, on the other hand, can make your equine’s coat dry and bleached. So a fly sheet will help protect your equine’s sensitive coat from the harsh sun rays. Do not choose fly sheets with an open weave as they fail to keep insects such as flies and mosquitoes away. If you notice your mare kicking and swishing at flies with a fly sheet, consider upgrading to a more rugged and form-fitting one. Similarly, a fly sheet during the hot summer months will make your equine too hot. So it’s important to use a fly sheet when it’s most comfortable and convenient for you and your mare. A good way to pick out the best horse blankets on the market is by understanding the features and description of one. Here’s what we took into consideration when picking the best of the best picks for you. Fabric: If an outdoor equine blanket lacks breathability and durability, is isn’t the right one. A good product is one which is waterproof and breathable. That said, you will find different types of blankets based on what they have been designed for. This means the fabric material of an anti-sweat blanket will have breathable and ventilation features. Similarly, a turnout blanket will have a waterproof build, which is not as important in an anti-sweat blanket. Most durable equine blankets are made up of a type of nylon or synthetic fiber. These materials have the capacity to keep your equine cool during the summer months. Or keep you warm during the winter months. Plus, the fabric comes with a breathable nylon bordering or lining to prevent hair fall and bald spots. The following chart illustrates the basic fabric weight type of a blanket and its fill weight. This will help you determine the best blankets for your equine. A lightweight blanket offers the least amount of warmth; best used during the summer months. That is because of its light weight and thin fabric build. A heavyweight blanket is the warmest blanket; best used during the winter months. A mid-weight blanket offers the best of both worlds. A good choice if you want a multi-purpose and efficient blanket for all seasons. The higher the denier count of a material, either nylon or synthetic, the sturdier the comforter is. Fit: A good fitting comforter is necessary as it protects your equine from the environment. And it keeps her warm during the winter months and cool during the summer months. We looked for blankets with proper fitting chest buckles, adjustable straps, detachable leg straps, and shoulder gussets. Surcingles are necessary in a comforter as it ensures a proper fit, regardless of the shape and size of an equine. The features must be aligned in such a way so as to encourage better mobility and flexibility. This has a lot to do with how well you measure your horse for a good fit (if you want to know more about measuring your equine, go to our FAQs section below). Other fit features that make even the best of the best horse blankets sophisticated are custom-tailored based on your equine’s needs. Some brands offer products with a unique “V” design to allow better mobility and flexibility while riding or galloping. Adjustable gussets also allow better body contouring in larger breeds so as to avoid bunching or slipping. During fitting, always remember that a horse’s neck and shoulder area is very sensitive. So that part of the body is most likely to rub or chafe or itch. An unreliable blanket with roughened edges will put pressure on these parts. Resulting in restriction in movement and soreness. Consider buying a fit that has a contoured neckline and an elastic around the neck. This tough and efficient horse blanket fails to disappoint. The Tough 1 600D Turnout Blanket is a denier and foal medium-heavy material comforter. Popularly best for small and miniature breeds. The 600 denier poly strength makes it durable enough to resist strong winds, rain, and other environmental elements. Plus, the fabric is designed to wick away moisture and reduce heat build-up. The accumulation of heat inside the fabric is very likely in waterproof blankets. But this product offers a coater outer shell and a cool inner shell to repel water and keep your horse dry while allowing heat to pass effectively. The only thing that got to us about this comforter is the fact that it isn’t as breathable as it seems. The material has a few inferior characteristics that make it incapable of fighting sweat. It is even prone to tears and rips, that is if your horse is prone to chewing or biting on blankets. However, the adjustable features make it a comfortable wear for all breeds. The Tough 1 1200D Snuggit is a heavy-duty, resilient, and breathable blanket. While the former pick is not suitable for horses that chew, this pick offers better resilience against such wear and tear. The material features a 1200 denier build while the lining itself is a close 210 denier. Making it one of the best horse blankets on the market. It is a good choice if you want adjustable neck and shoulder features, a double-sewn waterproof shell, and surcingles and front fasteners. It does everything you want it to and how. It seems like a good long-lived and form-fitting turnout. The Derby Original Classic Sheet is a fleece protection blanket. It is multi-functional in a way that surpasses most horse owners expectations. That is, for a horse blanket that is this inexpensive and lightweight. Available in varied sizes, it fights off moisture, sweat, and dust easily. So blanketing your horse during the wet, cold, or hot weather is no problem at all. Plus, the material is so flexible that you can fold it and store it as a stall blanket. It’s the best choice if you do not have enough space to store all your horse equipment, because it will practically anywhere and is easy to clean too. If you want a blanket with a hood, we recommend the Breyer Rambo Blanket. It comes in a simple traditional style and size. With sturdy surcingles and chest buckles, it feels and looks extremely comfortable. Plus, it features a simple tail flap for extra protection. 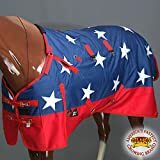 This is one the best horse blankets that fits well, looks good, and is fairly durable. You can pair it up with many accessories, if that’s what you want. And it’ll still protect your horse from dust and moisture. When you have too many horses to work with, buying an inexpensive, but durable blanket is necessary. In such a case, consider buying the Tough 1 Storm-Buster West Blanket. It is a good water repellent and weather-resistant blanket to have. If you go out for camping, you no longer have to leave your horse behind. The breathable fabric comes with a front buckle system for a secure fit. Also the surcingle and leg straps ensure the blanket sits perfectly on your equine without slipping. This is important for when your equine is galloping through the pasture. It avoids accidents and makes her feel comfortable. Boasting of a resilient rip stop technology, the Derby Originals Deluxe 600D Turnout is a good one. It features an outer shell made solely of 600 denier nylon. And an inner nylon lining of 210 denier. With a medium-weight poly-fill, this is the best turnout blanket anyone can ever have. For better adjustments, the double front buckles put less pressure on the shoulders and neck. While the adjustable leg straps, which are also replaceable in case damage, offer better mobility. The surcingle features a low cross design to support the belly. This is important just so your horse can train, gallop, and jump without restriction in movement. All-in-all, this turnout blanket is the best choice when you want better movability. The best choice for mid-weight breeds, the Intrepid International Free Runner is both waterproof and breathable. With 600 denier ripstop nylon construction and 210 inner shell denier lining, it offers simple, but highly effective protection against the environment. It even features a sturdy tail flap and shoulder gusset in case your horse is standing outdoors for too long. If you ask me, the polyfill and fleece protection are some of its best features on the list. Now that’s a tough combination to beat! This blanket offers extreme protection against the wet weather. With a 1200 denier ripstop outer shell and a heavyweight 400g polyfill, it does the job well. It can withstand daily wear and tear, just like our step-up pick, and the double-stitched taped resists horse bites. For ease of movement, the shoulder gussets removable elastic leg straps come with easy attachments. All these, and many more features, are insulated to resist the cold airy temperatures. So no rusting and no scratches! If you want winter protection only, we picked the Derby Winter Horse Stable Blanket. It is warm enough and covers all body parts including the tail and lower legs. The high neck and rounded shoulders design look inviting enough for anyone to try. 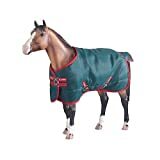 We think this winter blanket will suit your horse well. It comes with stable back-straps and front stitch are durable enough to withstand strong cold winds. Which makes this the only reliable and rugged winter blanket to look forward to this season. The Challenger 1200D Turnout Blanket is an all-weather winner. The 1200 denier polyester material is waterproof, breathable, and ripstop. This means it can withstand harsh UV rays, fleece, dust, moisture, and rain. The top quality fabric and woven lining make all the difference. As compared to other choices, the 400g polyfill add to its ruggedness in quality. To prevent rubbing, the fleece at the wither offers good protection, And, finally, so does the back leg straps for better movement. It’s important to know that not all equine blankets are worth considering. You need acceptable and effective temperature resistance, waterproofing, and weather protection from your blanket. And we’ve only chosen those that offer precisely that. Our top picks are great options for light, mid-, and heavyweight breeds. They are also very easy to clean and tuck in for storage. Plus, none of our picks suffered from any damage in our tests, which makes them durable for long-term use. The competition for the best horse blankets is sure difficult, but these picks make the chase much easier. Do horse blankets cause patchy hair loss? Patchy hair loss in horses is a serious condition. It can occur due to many internal and external factors including insect bites, allergies, infection, lice infestation, shedding, or old age. However, with the right horse blanket you can prevent bald spots from appearing more often than not. But with the wrong kind of horse blanket, the opposite of that is most likely to happen. The correct answer to this question lies in the proper diagnosis of patchy hair loss in horses. Patchy shedding, according to studies, can happen during a climatic shift. This means the hair sheds out during the beginning of a new season and generally reappears after a few months. This kind of hair shedding is completely natural in equine, unless provoked by a rough and bad blanket fabric. Another common cause of patchy hair loss in horses is skin scalding which occurs on the lower legs. This is primarily because of lack of proper hygiene and exposure to dirt and insects. The best way to prevent skin scalds is to cover your equine with a fly sheet or a cooling blanket (during the cold weather). This keeps your equine away from environmental toxins and other caustic irritants. Will the blanket fall off my horse when she’s running and galloping through the pasture? A sturdy and form-fitting horse blanket is not prone to shifting or slipping away from your equine once fitted. This is because it’s feature-packed with a chest closure, gussets, surcingles, elastic leg straps, and a tail cord for better body contouring. To understand the effectiveness of such a design, let’s study each feature separately. Surcingles minimizes excessive movement of a rug on an equine. This is when your equine is moving forward. A well-fitted comforter moves along with the horse and for that you need ease of movement with the help of surcingles. Surcingles are traditionally attached close to the equine’s belly. This positioning is necessary as the belly surcingles disallow the comforter from shifting or twisting from one side to the next. They also prevent the top sheet from blowing in the wind. So if your equine is galloping through the pasture, the surcingles will keep the blanket in its right place without resisting mobility and flexibility. These straps are very popular among high-quality horse blankets as they’re best used for securing the blanket from slipping. These legs straps and surcingles share a common function in this way. When your equine is galloping through the pasture, there is intense movement. Hence, the blanket is more likely to slip away from the body. With elastic leg straps, which are positioned right under the hind legs, the legs can move freely without the fear of chafing or slipping. Chest closure are used reduced the pressure off of your equine’s chest. Just so the horse blanket can be swiftly overlapped on both sides, a closure reduces the pressure of the firm and form-fitting sheet. This is necessary for equines that will be wearing a comforter for a very long period of time. A gusset offers freedom and ease of movement when necessary. The front legs, without a gusset, are most likely to feel a restriction in movement while wearing a rug. So a higher gusset adjustment releases pressure off of the equine’s shoulders which has a positive impact on the front legs for better movement. 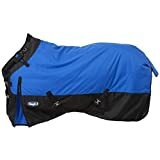 Why do I need the best horse blankets for my horse? Blanketing your equine can have both advantages and disadvantages. One good thing about blanketing your equine is to protect the coat from environmental elements such as the rain, dust, UV rays, and humidity. All these factors, as previously mentioned, can cause skin inflammation and sensitivity. Another positive aspect of using some of the best horse blankets is reducing the number of times you have to clip your horse’s hair during the winter months. A good comforter can keep your equine’s hair short for a longer time. And for horses living in extremely cold weather conditions, a warming comforter can reduce chills. You can even use an energy-efficient outdoor heater to keep your stable warm and pleasant. The best blankets are those that offer excellent warming and insulating properties during the cold months. Based on these factors, there are different types of blankets you can choose from. Starting from anti-sweat or coolers, fly sheets, waterproof rugs, to rain blankets. Each type has its own positive and negative consideration to look forward to. As for the downside of using the best blankets, lack of proper adjustability near the legs and neck can cause restriction in movement. But this can easily be corrected by opting for a product with accurate leg straps, gussets, and surcingles. These features will prevent the fabric from rubbing against your equine’s coat and will then work as a natural shield against environmental conditions. How to keep the best horse blanket clean? Equine blankets are prone to wear and tear once you have them around the stable. And because they keep dust and moisture away from your equine, cleaning them regularly is extremely important. This helps preserve their efficacy in function. Lightweight blankets are best washed in a washing machine. But first you need to clean out all the dust particles from the fabric to prevent detergent buildup during washing. The best way to unclog dirt particles is with the help of a hose. Use a mesh washing bag to thoroughly clean the gussets, elastic straps, and other parts of the comforter. Following that, use a mild cleaning detergent and cool water to wash the blankets in a washing machine. Avoid using a fabric softener as that will hinder the durability factors of the fabric. This includes the fabric’s waterproof and insulating properties. Heavyweight blankets are best cleaned by hand. Use a shedding tool to remove dust and other particles from the fabric. You can even use a stiff plastic brush to loosen all dust particles. Following that, use a hose to wash the blankets with cold water while scrubbing down with a medium-bristle plastic brush. Scrub the fabric with a powerful detergent to do away with hidden dirt or toxins. Remove as much soap from the fabric as possible. Any residue soap in the fabric can cause skin irritation and lead to infection, especially if your equine sweats a lot. For drying the blankets, line-dry them over a fence. Make sure each comforter is exposed to the sun and the wind. Avoid tumble drying them in a washing machine as the extreme heat can damage the insulation and breathability of the blankets. As soon as the blankets are completely dry, store them in a moisture-tight box for further use. How to calculate my horse’s right blanket fit size? The only way you can find the right fitting comforter for your equine is after measuring her size. If a comforter isn’t comfortable and form-fitting, it’s of no good use to you at all. Whether you’re buying a cooler or an anti-sweat rug, fitting to size is very important. You might have to try new ways to measure your equine’s size, but the final result is definitely worth the effort. That said, here’s what you need to calculate your equine’s right blanket fit size. A long string, a measure tape, a marker, and a note pad with a pen for taking down measurements. Before you begin taking down the correct measurements, make sure you tie your horse comfortably. Use the string to measure around the shoulders. Move the string around your equine’s haunches toward the edge of the tail. While doing so, keep the string parallel to the ground at all times. Using the marker, mark down the part where the string meets the edge of your equine’s tail. Measure the length of the string against measure tape and set down the accurate number on the notepad. This is the only body measurement you need for your equine. However, if it’s an odd number, plus one to make it an even number measurement. Most blankets brands offer even number sizing charts. The added inch accommodates extra features such as the front fasteners or the elastic straps. Certain types of blankets such as the turn-out rug are designed in unique cuts. It’s best to rely on the manufacturer’s sizing chart before making a final purchase. If your equine is uncomfortable around the rattle of a measuring table, use a twine or a piece of string for measuring. Keep the measure tape away from your equine to avoid any sudden resistance. Make sure the manufacturer has a decent return policy in case the size is incorrect. It’s important to wrap the blanket around your equine before making a final purchase. Use a lint remover to keep the new product clean before returning. If you are unable to find the right fit for your equine, buy a bigger size and alter the comforter to fit. Consider consulting a professional for getting the alterations done effectively. Just in case you need to measure your equine’s height, stick the measurement perpendicular to the ground beside the horse. While doing so, make sure your equine is standing squarely on level ground. A good equine comforter needs to shield against heavy winds, rain, and dust. We looked for blankets that are easy to clean, durable, and effective. It’s good for owners who don’t like to accommodate extra-heavy or messy blankets that create a clutter. Finally, we scoured through many reviews and found and tested a good list on the best durable and long-lived blankets for our readers. And as for our best of the best pick, the clear winner is the Tough 1 600D Waterproof Turnout Blanket.